Definition: The Guerrilla Marketing is the strategy adopted by the firms to push their products in the market by using both the conventional and nonconventional means, with the intention to harass or demoralize the competitor. The guerrilla marketing is the low-cost or no cost, strategy that can reap greater benefits if applied correctly. The companies adopt this strategy to create a buzz about its product and services by adopting any unexpected or nonconventional means. But however, it is to be ensured that no lines of legality and morality have been crossed by the firms while promoting their products. The companies adopt several strategies to dominate the competitors and rule in the market. The most common way to capture the market is to reduce the price drastically such that the competitor is not able to meet it at any cost. The company participates in the controversial discussions, generally pertaining to the competitor, and take a stand to defend itself against the opposing viewpoints. With this, the company tries to demoralize the competitor and try to bring its product to the forefront. Some companies give their products as a free sample to the customers with the intention to create a business for the product. The aggressive follow-ups are carried out to make sure that customer does not forget about the product and continuously persuading them to purchase it over the other products available in the market. The companies, sometimes honor the competitor’s coupons or the offers at their retail outlets with the intention to capture the competitor’s customer base. Companies offer several cash benefits or extended credit terms to its customers that may not be possible for the competitors to match with. Nowadays, with the intense competition, companies are using the social networking sites such as Facebook, twitter, google plus to make their products visible to a large number of people.The company can post its product along with the detailed information on these sites and can fetch more “likes” that will increase the credibility of the company. 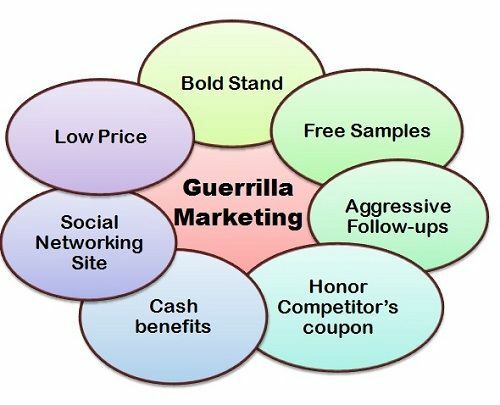 Generally, the guerrilla marketing strategy is adopted by the small business firms who want to bring their products in front of as many people as possible, thereby trying to capture the competitor’s market share.